Born January 6, 1982 in Ndola, Zambia, Amon has burst on the chess blazing a trail of tournament successes unprecedented for a player from the African continent. Already an IM, he took up the royal sport from his brother at the age of 10, won his first tournament at 12, and won the Zambian championship at age 14. He won the African Junior Championship both in 1999 and 2000 (both GM norms). Upon his rise came a string of successes including an equal 2nd at the 2000 world Junior Championships where he scored 8½-4½. The young IM has enjoyed success in tournaments throughout the world and has played in approximately 30 countries. Simutowe won a silver medal on board one for the Zambian national team at the 2000 Olympiad (Istanbul, Turkey) and has qualified for and competed in the FIDE World Championship on three occasions. 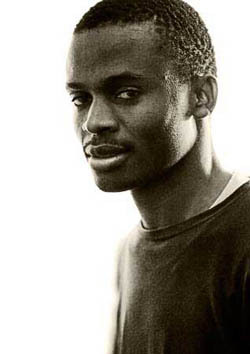 Simtuowe left his native Africa to pursue higher education in the United States at University of Texas at Dallas (UTD). While being a resident in Dallas he competed for the collegiate team and help UTD win two collegiate championships. He was a well-liked and well-respected member of the Dallas chess community and participated in many events. After earning a degree in finance and economics with high honors from the University of Texas at Dallas, he embarked on a path to earn his final norm. After embarking on a tour of tournaments in the U.S., he traveled to the Netherlands to compete in the Euwe Stimulus tournament. Simutowe scored a stunning victory and earned his final GM norm scoring an undefeated 7½-1½. He becomes the 6th Grandmaster in the history of Africa, the first from the sub-Saharan region. Read, "The GM Journey of Amon Simutowe," ChessBase, 1 September 2007. Read, "Simutowe's Last Mile," The Chess Drum, 31 July 2009. Read "Talking Drum" interview on this young African star! Read Simutowe's essay, "My Trip to Nigeria"